Pursuit of Felicity: Creamy Pumpkin Soup Recipe. 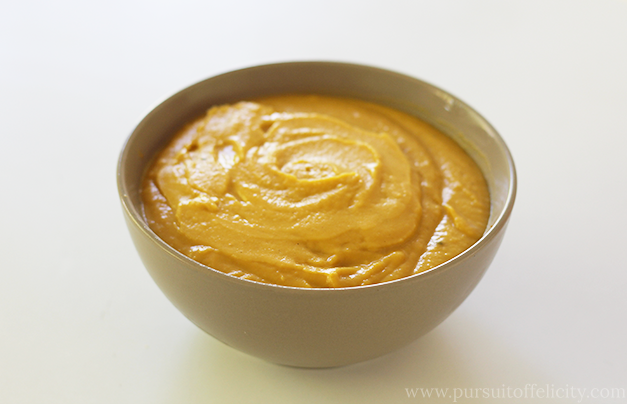 This is hands down the best pumpkin soup recipe I have ever tried - and I have tried a lot. It is incredibly easy and affordable to make, uses minimal ingredients, and takes about 40 minutes all up. This is the pumpkin soup recipe that I will be passing down to my kids. Simple, tasty and extremely filling. What more could you want? 1. Chop pumpkin up into small cubes (roughly 1cm) and finely dice your onion. Throw into a large/deep saucepan and cover with liquid vegetable stock. 2. Bring saucepan to the boil, then reduce to about half the heat, cover and simmer for 20 minutes. 3. Once pumpkin is soft, remove from the stove and use a stick blender to blend into a soup like consistency. 4. Stir in cream, then sprinkle in some nutmeg and pepper to taste. 5. Serve with fresh crusty bread or home made croutons. Yum I'm going to make this! July + August Design Work! Hearty Parmesan Tomato Soup Recipe. Snap Happy Sunday // Dad's 50th Birthday Party! 5 things that every good blog design should have! Feeling more positive about moving to Townsville. Snap Happy Sunday // Mount Tamborine.